Many Arabs are opposed to the state of Israel. A phenomenon generally seen in Arab countries is that leaders who want to make themselves popular with their citizens go out of their way to show how anti-Israel they are. Iranian leader Ahmadinejad, who may once have been an exemplary revolutionary but does not possess too much luggage in the brain department, is again trying convince the Arab world he is not as stupid as his words and deeds seem to suggest. What better way to impress the Arab world, the weak-minded bigot seems to think, than by organizing all kinds of manifestations against Israel? That's bound to make him popular! Mahmoud, however, seems to be incapable of grasping the difference between Israel and jews. So a few moths ago he was seen to organize an exhibition of antisemitic cartoons. Needless to say Mahmoud was cheered by the usual crowds of Iranian bigots. Now mr Ahmadinejad has found a new ploy to demonstrate what a fine Arab (read: brainless bigot) he is. He is going to 'prove' that there has never been a holocaust. So he organizes a conference in which the holocaust will be discussed 'scientifically'. When mr Ahmadinejad opens the conference, he just states the holocaust is a myth -- before any of the advertized scientific discussion can have taken place. One of the participants to the conference, a woman named Behnaz Fazel, was heard to say the number of six million jews killed was a gross exaggeration -- emphasizing her expertise by not even being able to tell when World War II took place. 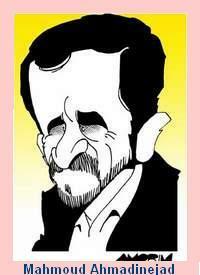 Not everybody agrees with Mr Ahmadinejad. For instance, in an open letter to the Iranian president, Mahmoud al-Safadi (who was sentenced to 27 years by Israel for throwing Molotov cocktails during the 1988 intifada) says Mr Ahmadinejad's stance is a "great disservice to popular struggles the world over ... Perhaps you see Holocaust denial as an expression of support for the Palestinians. Here, too, you are wrong. We struggle for our existence and our rights, and against the historic injustice that was dealt us in 1948 ... Our success and our independence will not be gained by denying the genocide perpetrated against the Jewish people, even if parts of this people are the very forces that occupy and dispossess us to this day." Mr Safadi says that reading the works of Arab intellectuals helped convince him that the Holocaust was a historical fact. Students from a Teheran university (who have been more and more oppressed since Ahmadinejad came to power) cut off Ahmadinejad as he addressed the conference, shouting phrases like "corrupt," "liar," and "death to the dictator". And what did the brainless president respond? He could find no better answer than these students must be Americans. In the West, we may only wonder if a country that is so much filled with hatred should really be allowed to possess nuclear bombs.